Our dentists have provided friendly oral care to patients from one generation to the next. For just over 30 years, Michelson’s Dental Surgery in Wangaratta has made it simpler for your family to access quality, compassionate dentistry. Our comprehensive dental services will help you smile brighter. Whether you need a routine checkup, crowns or bridges, the dentists at Michelson’s Dental Surgery focus on proactive, preventative care. Through preventative care, we can help limit the extent of treatment that you need in the future. Transform the appearance of your teeth through our variety of cosmetic dental choices. From in-house teeth whitening to beautiful porcelain veneers, our aesthetic dental options are the next step to getting a beautiful smile makeover. Does going to the dentist make you feel nervous? 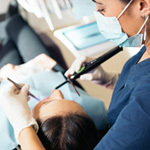 Have you experienced poor dental care in the past? Our general anaesthetic options make it easier for both adults and children to access the care that they deserve. We partner with local anaesthetists to complete complex treatment while you “sleep”. How long has it been since you last saw a dentist? If it’s been more than six months, contact us on (03) 5721 8033 today to schedule your next checkup.